Guesty is a cloud-based, property management system designed exclusively for Airbnb and vacation rental managers. 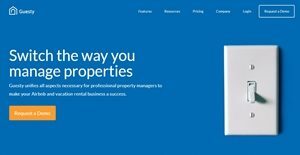 The platform was created with one purpose in mind – to tackle the needs of many property managers worldwide by providing them automation tools, reporting capabilities and channel management. Guesty allows you to oversee every area of daily operations and maintain high quality service for clients. You can also manage more properties through multiple Airbnb accounts together with over two dozen different booking platforms. All of these you can do on one unified dashboard, inbox and calendar, with the 24/7 guest communication service available for you to support and screen your guests. Dubbed as the ultimate solution to handle all aspects of your property management business, Guesty combines the convenience of scalability to suit your operation and the power of automation that streamlines everything from messaging and reviews to pricing and tasks. You can generate reports on listings, guest data and reservations as well as supervise bookings websites and payment processing. Furthermore, you’ll have all your data centralized for easy access, search, reporting and sharing anytime right from your dashboard. Guesty provides you an array of automation tools to handle repetitive tasks and streamline business operations. Everything from listing pricing, replying to guests, and reviewing staff tasks can be automated to help you shift precious time from daily operational management and focus more on strategically expanding your business. You can create sequences of customized messages and have them conveyed out to guests before, during or after their stay; choose the time to have messages delivered; and select the medium you want them sent such as email, SMS, or Airbnb platform. Likewise, your physical presence in the office won’t be a problem since you can have an instant reply sent out as soon as you get an inquiry with an Automated Answering Machine, allowing you to maintain consistent response rate on Airbnb. In addition, you can develop a set of pricing rules through the Auto Pricing feature to maximize profits from each listing. Whether it’s a calendar gap that needs to be filled in or a price drop of remaining un-booked days, you can optimize your nightly rates according to your pre-defined specifications. Meanwhile, Auto tasks enables you to automate tasks for ground staff such as assigning cleanings, maintenance, or a check-in and have said tasks automatically delivered to them each time a new reservation comes in. Your entire business tasks and processes can be run through the Guesty Dashboard. You can collect and view any information about your guests, reservations, listings and staff; automate your daily activities, such as communication with guests and staff, reservations management; and handle calendars from multiple booking sites simultaneously, all from the convenience of a centralized operation in your dashboard. Coupled with the system’s top-notch automation, you can manage and assign your entire team’s tasks and work schedules, automatically generate assignments for cleaning and check-ins, as well as track in real time the progress of each task. Intuitive, all-in-one operation with the dashboard gives you complete management control and unparalleled efficiency. You easily gather data, accessed them from a centralized repository, generate reports, and share them quickly – all automated and hassle-free. Moreover, you are afforded the amenity of organizing all your inventory, information and communication in one place. Smoothly distribute and manage listings through multiple channels and websites with Guesty’s Channel Management function. It allows you to seamlessly distribute your listings through more than 30 major online travel agencies and vacation rental sites – such as Airbnb, Booking.com, HomeAway, Tripadvisor, VRBO, Expedia and more. All availability and pricing from your channels are synced into one Multi-Calendar which you can adjusts to include last minute deals, season, or any other changes. This ensures that you get the most updated view of all your properties, regardless of where they are listed. You may think managing multiple-channel listing is a complicated matter; fact is, it is. Guesty takes care of that by integrating all your property listings from dozens of short-term and vacation rental sites into your Guesty Dashboard and managing all of them from a single account. No more logging in to various platforms just to see and find availability of your properties on different channels. Guesty removes the guest work and gives you accurate, relevant and real time data for productive and profitable management. You can utilize Guesty’s seamless payment processing system designed specifically for property managers for an easy and reliable collection of accommodation fares, together with all reservation related fees. All charges are accumulated under the guest’s reservation and can be safely debited upon check-out or at any time based on your company’s policies. You get the ability to receive and process payments, track transactions and swiftly send guests their receipts. With all transaction details and credit card information securely stored and saved, you do away from requiring returning guests to provide you with billing information again. Guesty’s reporting tool allows you to create weekly summaries of payments, cancellations, and check-ins; customize specific reports to your needs; and have them delivered when you choose. Furthermore, similar to a hotel amenity, you can encourage your guests to purchase concierge goods or services and pay after the stay, or cross sell a supplementary car service, gift baskets, special drinks, or travel accessories. If you are interested in Guesty it might also be a good idea to analyze other subcategories of Best Hotel Management Software collected in our base of B2B software reviews. Each company has its own characteristics, and may call for a particular type of Hotel Management Software solution that will be designed for their business size, type of clients and employees and even particular industry they support. We advise you don't count on finding a perfect app that is going to work for every business regardless of their background is. It may be a good idea to read a few Guesty reviews first and even then you should pay attention to what the service is intended to do for your business and your employees. Do you need an easy and straightforward app with only essential functions? Will you really make use of the advanced functionalities required by pros and large enterprises? Are there any specific features that are especially beneficial for the industry you work in? If you ask yourself these questions it is going to be much easier to locate a reliable app that will match your budget. How Much Does Guesty Cost? We realize that when you make a decision to buy Hotel Management Software it’s important not only to see how experts evaluate it in their reviews, but also to find out if the real people and companies that buy it are actually satisfied with the product. That’s why we’ve created our behavior-based Customer Satisfaction Algorithm™ that gathers customer reviews, comments and Guesty reviews across a wide range of social media sites. The data is then presented in an easy to digest form showing how many people had positive and negative experience with Guesty. With that information at hand you should be equipped to make an informed buying decision that you won’t regret. Even a 60 year old man can launch a Multimillion dollar Airbnb Biz from a Notebook and a Phone!!! What are Guesty pricing details? What integrations are available for Guesty? The People are the Genius of Guesty, The Platform has endless Possibilities, so, ask Guesty what you need, and they will produce it! If you need more information about Guesty or you simply have a question let us know what you need and we’ll forward your request directly to the vendor.